Cricket Association of Bihar secretary Aditya Verma has written to ICC president Alan Isaac urging the parent body to stop Narayanaswami Srinivasan from attending next month's ICC Executive Board meeting as its first chairman. In his letter, Verma alleged that the ICC has kept its "mouth shut" on IPL "scams" and must prevent the Tamil Nadu strongman from attending its meetings till the Supreme Court of India announces its final verdict on IPL spot-fixing and betting scandal. He asked why the ICC is not enquiring about the IPL-related issues. "As per ICC conduct rules, if any player's name comes up in any illegal acts, it is the duty of ICC to investigate. But I am sorry to say, ICC is not taking any interest till today," Verma was quoted as saying in the letter. He also sarcastically commented that ICC has now become 'India Cement Cricket'. "Has the ICC become India Cement Cricket?" he asked. 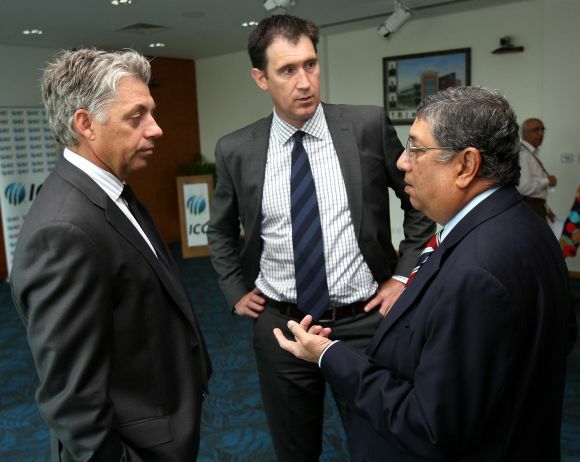 He urged it to stop Srinivasan from functioning as chairman of the ICC's executive board till the probe is over. "Once again I am requesting on the behalf of my CAB to immediately intervene and take appropriate action against guilty persons. ICC must respect the Indian law; the apex court of the country has stopped the BCCI president from functioning till the probe concludes." Star batsman Kevin Pietersen has embarked on a journey to produce future stars. The maverick England discard is all set to open a state-of-the-art academy in Dubai in October, with India earmarked as his second destination. "It's going to start in October in Dubai. The venue is still to be confirmed. Kids from 7 to 18 years of age will be part of the academy," Pietersen said. "There will be different courses and we will encourage kids from all over the world to come to take up the course for two weeks. "I am going to fund a lot of disadvantaged kids and will have a hands-on approach towards the academy," the former England batsman added. India is also in his wish-list as far as setting up the 'Kevin Pietersen Academy' is concerned. "Definitely, India is one of the places. I am going to target India next." "It's been really quite exciting for me, entering a fantastic journey and I am looking forward to it; I can't wait for it to start. It's (the academy in Dubai) is the first one of many," he added. Rajasthan Royals batsman Karun Nair, who fashioned the team's emphatic win over Delhi Daredevils Saturday night's IPL match, says encouragement from captain Shane Watson and mentor Rahul Dravid is helping him perform as an opener. With Dravid now watching the action from the sidelines, Nair is batting alongside Ajinkya Rahane at the top. The Karnataka batsman's unbeaten 73 off 50 balls not only ensured the team chased down Daredevils' 152 for five easily, but the solid knock could help him cement his place in Rajasthan's playing eleven. "There is always pressure when you have got quality batsmen waiting in the dug-out. I was looking to give myself little more time in the middle and Watto and the support staff backed me to do well. That really helped," Nair said of his effort. "Even Rahul (Dravid) just told me to play with confidence and take more time at the centre. He has been of great help," said the 22-year-old, who last year scored three hundreds for Karnataka in his debut Ranji Trophy season, helping the team win its first Ranji title in 15 years. Asked how was the experience as an opener after coming lower down the order for Karnataka, Nair replied, "I used to open at the junior levels but there was no opening slot in the Karnataka Ranji team. Back opening again I think have I adjusted really well." "He encourages all the youngsters. We play as a team and are not depended on a particular player. I think that is why are winning most of the matches," said Nair about his team, which is third in the points' table after four wins in six games.